Utah’s known for dry powder, and Canyons gets 355 inches of the stuff per year. The resort’s recent $50-million upgrade added a 20-million gallon reservoir that serves as a lake, a heated lift called the Orange Bubble Express, and, most notably, 300 more skiable acres for a grand total of 4,000 acres that divide out into 182 trails whose 3,190 vertical feet are served by 19 lifts. Only 10 percent of the runs here are green, so lovers of black and blue tend to have more to do. The ski school stocks high-level instructors who can instill confidence, whether it’s skiing the fall line you want to learn, or how to light up the diamond slopes. Boarders ply the single terrain park, while others snowshoe and XC ski. 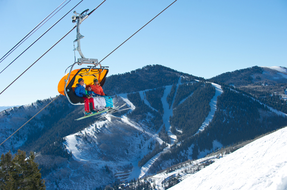 Being in Park City helped Canyons do well in the off-hill recreation category: Locally, there’s an ice arena, an alpine coaster, sleigh rides, a tube park, geocaching, a bowling alley, and much more—you can even test out the bobsled or luge at the Utah Olympic Park. Free buses run throughout town and make multiple stops at Canyons. The resort itself features a pedestrian village with shops, bars, and a dozen new eateries: The Farm, for one, is a zero-waste restaurant whose ingredients come from within 200 miles—a reflection of Canyons’ serious environmental ethic. The resort has also converted to lower-emissions snowmobiles and implemented an all-mountain recycling program. Hospitality here operates at a high pedigree because all of Hollywood comes to stay each January during the Sundance Film Festival—a fact that drives prices up all season long. There are plenty of ski valets at the resort’s eight hotels, including the excellent Hyatt Escala Lodge and the comfortable Grand Summit Hotel, both of which are ski-in/ski-out, as is the more residential Vintage on the Strand. The Waldorf Astoria brings with it all the refinement associated with its name, and its Asian-inspired Golden Door Spa rubs out any of the status-related anxiety that can arise here. If you’d rather miss the frenzy that Sundance stirs up, come instead between March 22 and 31, when Spring Grüv invites pond-skimmers, musicians, and big-name snow performers. To see this article at Outside Magazine, click here.